Clockwise from top left: Verrazzano-Narrows Bridge looking towards Staten Island, Richmond County Bank Ballpark, Fort Wadsworth looking towards Brooklyn, the Staten Island Museum, a Staten Island Railway train enters Huguenot station. Staten Island (/ˌstætən ˈaɪlənd/) is one of the five boroughs of New York City, in the U.S. state of New York. Located in the southwest portion of the city, the borough is separated from New Jersey by the Arthur Kill and the Kill Van Kull and from the rest of New York by New York Bay. With an estimated population of 479,458 in 2017, Staten Island is the least populated of the boroughs but is the third-largest in land area at 58.5 sq mi (152 km2). The borough also contains the southern-most point in the state, South Point. Brooklyn (/ˈbrʊklɪn/) is the most populous borough of New York City, with an estimated 2,648,771 residents in 2017. Named after the Dutch village of Breukelen, it borders the borough of Queens at the western end of Long Island. Brooklyn has several bridge and tunnel connections to the borough of Manhattan across the East River, and the Verrazzano-Narrows Bridge connects it with Staten Island. 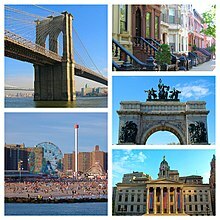 Since 1896, Brooklyn has been coterminous with Kings County, the most populous county in the U.S. state of New York and the second-most densely populated county in the United States, after New York County (which is coextensive with the borough of Manhattan). The Bronx is the northernmost of the five boroughs of New York City, in the U.S. state of New York. It is south of Westchester County; northeast and east of Manhattan, across the Harlem River; and north of Queens, across the East River. Since 1914, the borough has had the same boundaries as Bronx County, the third-most densely populated county in the United States. Manhattan (/mænˈhætən, mən-/), often referred to locally as the City, is the most densely populated of the five boroughs of New York City and its economic and administrative center, cultural identifier, and historical birthplace. The borough is coextensive with New York County, one of the original counties of the U.S. state of New York. The borough consists mostly of Manhattan Island, bounded by the Hudson, East, and Harlem rivers; several small adjacent islands; and Marble Hill, a small neighborhood now on the U.S. mainland, physically connected to the Bronx and separated from the rest of Manhattan by the Harlem River. Manhattan Island is divided into three informally bounded components, each aligned with the borough's long axis: Lower, Midtown, and Upper Manhattan. 30 Rock is an American satirical television sitcom created by Tina Fey that ran on NBC from October 11, 2006, to January 31, 2013. The series, based on Fey's experiences as head writer for Saturday Night Live, takes place behind the scenes of a fictional live sketch comedy show depicted as airing on NBC. The series's name refers to 30 Rockefeller Plaza in New York City, the address of the Comcast Building, where the NBC Studios are located and where Saturday Night Live is written, produced, and performed. This series is produced by Broadway Video and Little Stranger, Inc., in association with NBCUniversal. 30 Rock episodes were produced in a single-camera setup (with the exception of the two live episodes that were taped in the multiple-camera setup), and were filmed in New York. The pilot episode premiered on October 11, 2006, and seven seasons followed. The series stars Fey with a supporting cast that includes Alec Baldwin, Tracy Morgan, Jane Krakowski, Jack McBrayer, Scott Adsit, Judah Friedlander, Katrina Bowden, Keith Powell, Lonny Ross, John Lutz, Kevin Brown, Grizz Chapman, and Maulik Pancholy. The pilot episode of the American situation comedy series 30 Rock premiered on October 10, 2006, on the CTV Television Network in Canada, and October 11, 2006, on NBC in the United States. The episode was directed by Adam Bernstein and written by Tina Fey, the series' creator, executive producer, and lead actor. In 2002, Tina Fey, then head writer of Saturday Night Live (SNL), pitched the idea for a series about a cable news network to NBC, which rejected it. Two years later, Fey approached NBC with a similar idea: a behind-the-scenes look at The Girlie Show, a television show similar to SNL. NBC approved the series in May 2006 and production began shortly after. Although the episode received generally positive reviews, it finished third in its timeslot among all viewers and among adults aged 18 to 49. Critics praised the performances of Jack McBrayer and Jane Krakowski, who played Kenneth Parcell and Jenna Maroney, respectively. An R68 train entering the station from the relay tracks. Mariano Rivera (born November 29, 1969) is a Panamanian-American former professional baseball pitcher who played 19 seasons in Major League Baseball (MLB) for the New York Yankees, from 1995 to 2013. Nicknamed "Mo" and "Sandman", he spent most of his career as a relief pitcher and served as the Yankees' closer for 17 seasons. A thirteen-time All-Star and five-time World Series champion, he is MLB's career leader in saves (652) and games finished (952). Rivera won five American League (AL) Rolaids Relief Man Awards and three Delivery Man of the Year Awards, and he finished in the top three in voting for the AL Cy Young Award four times. He was elected to the Baseball Hall of Fame in its class of 2019 in his first year of eligibility, and was the first player ever to be elected unanimously by the Baseball Writers' Association of America (BBWAA). Raised in the modest Panamanian fishing village of Puerto Caimito, Rivera was an amateur player until signed by the Yankees organization in 1990. He debuted in the major leagues in 1995 as a starting pitcher, before permanently converting to a relief pitcher late in his rookie year. After a breakthrough season in 1996 as a setup man, he became the Yankees' closer in 1997. In the following seasons, he established himself as one of baseball's top relievers, leading the major leagues in saves in 1999, 2001, and 2004. Rivera primarily threw a sharp-moving, mid-90s mile-per-hour cut fastball that frequently broke hitters' bats and earned a reputation as one of the league's toughest pitches to hit. With his presence at the end of games, signaled by his foreboding entrance song "Enter Sandman", Rivera was a key contributor to the Yankees' success in the late 1990s and early 2000s. An accomplished postseason performer, he was named the 1999 World Series Most Valuable Player (MVP) and the 2003 AL Championship Series MVP, and he holds several postseason records, including lowest earned run average (ERA) (0.70) and most saves (42). Interstate 295 (I-295) is an Interstate Highway within New York City. Measuring 9.10 miles (14.6 km) in length, I-295 originates at Hillside Avenue (New York State Route 25 or NY 25) in Queens, running north across Queens and over the tolled Throgs Neck Bridge, to Bruckner Interchange, a junction with I-95, I-278, I-678, and the Hutchinson River Parkway in the Bronx. From south to north, I-295 intersects the Grand Central Parkway, I-495 (the Long Island Expressway), and the Cross Island Parkway in Queens before crossing the Throgs Neck Bridge and splitting with the I-695 (Throgs Neck Expressway). In Queens, I-295 is also known as the Clearview Expressway. 34th Street–Hudson Yards is a New York City Subway station in Manhattan's West Side on the IRT Flushing Line, and is the western (railroad south) terminus for the 7 local and <7> express services. It has two tracks and one island platform, with two levels of mezzanines: one directly above the platform and the other directly below street level. The station directly serves the Hudson Yards mega-development above it, and is located within the greater Hudson Yards neighborhood. The station contains two entrances along Hudson Boulevard: a primary entrance south of 34th Street, and a secondary entrance south of 35th Street. The station, originally part of the city's bid for the 2012 Summer Olympics and the failed attempt to build the West Side Stadium, was first scheduled to open in summer 2012. When London was chosen for the Olympics, the opening date was pushed to December 2013. In 2011, the opening was postponed to June 2014, pending the completion of the escalators and elevators in the station. After a series of delays involving escalator, elevator, and fire and safety systems, the station finally opened on September 13, 2015. The 34th Street station is the first completely new station in the New York City Subway system since 1989, as well as the first such station funded by the government of New York City since 1950. Chaim Koppelman (November 17, 1920 – December 6, 2009) was an American artist, art educator, and Aesthetic Realism consultant. Best known as a printmaker, he also produced sculpture, paintings, and drawings. A member of the National Academy of Design since 1978, he was president of the Society of American Graphic Artists (SAGA), which presented him with a Lifetime Achievement Award in 2004. He established the Printmaking Department of the School of Visual Arts in 1959, and taught there until 2007. Koppelman was an early student of Aesthetic Realism, the philosophy founded in 1941 by Eli Siegel, which is based on the principle, "All beauty is a making one of opposites, and the making one of opposites is what we are going after in ourselves". This principle informed Koppelman's art, teaching, and his work as an Aesthetic Realism consultant. About the importance of this principle to art and life, Koppelman stated, "When Eli Siegel showed that what makes a work of art beautiful – the oneness of opposites – is the same as what every individual wants, it was one of the mightiest and kindest achievements of man's mind". Koppelman's art is noted for its originality, masterful technique, humor, and power. He is represented in most major print collections, including New York's Museum of Modern Art, Guggenheim Museum, Whitney Museum, Metropolitan Museum, New York Public Library, Brooklyn Museum, Philadelphia Museum of Art, National Gallery, Smithsonian Institution, and Hirshhorn Museum and Sculpture Garden in Washington, DC, and the Victoria and Albert Museum in London. Manhattan has been described as the cultural, financial, media, and entertainment capital of the world, and the borough hosts the United Nations Headquarters. Anchored by Wall Street in the Financial District of Lower Manhattan, New York City has been called both the most economically powerful city and the leading financial center of the world, and Manhattan is home to the world's two largest stock exchanges by total market capitalization: the New York Stock Exchange and NASDAQ. Many multinational media conglomerates are based in Manhattan, and the borough has been the for numerous books, films, and television shows. Manhattan real estate has since become among the most expensive in the world, with the value of Manhattan Island, including real estate, estimated to exceed US$3 trillion in 2013; median residential property sale prices in Manhattan approximated US$1,600 per square foot ($17,000/m2) as of 2018, with Fifth Avenue in Midtown Manhattan commanding the highest retail rents in the world, at US$3,000 per square foot ($32,000/m2) in 2017. On August 8, 2009 at 11:53 a.m. (15:53 UTC), nine people died when a tour helicopter and a small private airplane collided over the Hudson River near Frank Sinatra Park in Hoboken, New Jersey. The aircraft were in an area known as the "Hudson River VFR Corridor", which extends from the surface of the river to altitudes of 800 to 1,500 feet (240 to 460 m) at various locations along the Hudson River in the immediate area of New York City. Within this corridor, aircraft operate under visual flight rules, under which the responsibility to see and avoid other air traffic rests with the individual pilots rather than with the air traffic controller. Alphonse "Buddy" Fletcher Jr. (born December 19, 1965) is an American former hedge fund manager and founder of the Fletcher Foundation. He began his career as a quantitative equity trader at Bear Stearns and later worked at Kidder, Peabody & Co. Fletcher, who is African American, sued Kidder Peabody for racial discrimination. Although his racial discrimination claims were dismissed, he eventually won an arbitration award of US$1.26 million. Fletcher has also been involved in litigation centered on a dispute with the board of The Dakota apartment building in New York City. Broadway Junction is a New York City Subway station complex shared by the elevated BMT Canarsie Line and BMT Jamaica Line, and the underground IND Fulton Street Line. It was also served by trains of the Fulton Street Elevated until that line closed in 1956. It is located roughly at the intersection of Broadway, Fulton Street and Van Sinderen Avenue at the border of Bedford-Stuyvesant and East New York, Brooklyn. The complex is served by the A, J, and L trains at all times; the C train at all times except late nights; and the Z train during rush hours in the peak direction only. The station is adjacent to the East New York Yard and a complex junction between the tracks leading to the yard, the Canarsie Line and the Jamaica Line. The structure of the elevated station still contains the ironwork for the trackways used by the old Fulton Elevated. The station has a single exit and entrance through a fare control building located at the eastern end of the Fulton Street Line station. There is evidence of closed exits from the Jamaica Line platforms. American Airlines Flight 587 was a regularly scheduled international passenger flight from New York's John F. Kennedy International Airport to Las Américas International Airport in Santo Domingo, the capital of the Dominican Republic. On November 12, 2001, the Airbus A300B4-605R flying the route crashed shortly after takeoff into the Belle Harbor neighborhood of Queens, a borough of New York City. All 260 people aboard the plane (251 passengers and 9 crew members) were killed, along with 5 people on the ground. The Port Authority of New York and New Jersey (PANYNJ) is a joint venture between the U.S. states of New York and New Jersey, established in 1921 through an interstate compact authorized by the United States Congress. The Port Authority oversees much of the regional transportation infrastructure, including bridges, tunnels, airports, and seaports, within the geographical jurisdiction of the Port of New York and New Jersey. This 1,500-square-mile (3,900 km2) port district is generally encompassed within a 25-mile (40 km) radius of the Statue of Liberty National Monument. The Port Authority is headquartered at 4 World Trade Center and is a member of the Real Estate Board of New York. Pelham Bay Park is a municipal park located in the northeast corner of the New York City borough of the Bronx. It is, at 2,772 acres (1,122 ha), the largest public park in New York City. The park is more than three times the size of Manhattan's Central Park. The park is operated by the New York City Department of Parks and Recreation (NYC Parks). Pelham Bay Park contains many geographical features, both natural and man-made. The park includes several peninsulas, including Rodman's Neck, Tallapoosa Point, and the former Hunter and Twin Islands. A lagoon runs through the center of Pelham Bay Park, and Eastchester Bay splits the southwestern corner from the rest of the park. There are also several recreational areas within the park. Orchard Beach runs along Pelham Bay on the park's eastern shore. Two golf courses and various nature trails are located within the park's central section. Other landmarks include the Bartow-Pell Mansion, a city landmark, as well as the Bronx Victory Column & Memorial Grove. ... that the first Edison incandescent lamp-illuminated home was James Hood Wright's residence in New York City in 1881? ... that horse carcasses, and trash from three of New York City's boroughs, were once processed at Barren Island, Brooklyn? ... that when it opened, the Brooklyn–Battery Tunnel in New York City was the second-longest underwater vehicular tunnel in the world? ... that New York City's Citi Bike is the largest bicycle-sharing system in the United States? ... that the New York City Subway G train is the only non-shuttle service that does not run through Manhattan? ... that Flushing Meadows–Corona Park in New York City hosted two world's fairs? ... that after Silence=Death posters appeared around Manhattan, William Olander created a New Museum exhibit highlighting public indifference to AIDS victims? ... that an island in New York City used to be a summer campsite, with up to half a million visitors by 1917? Do you have a question about New York City that you can't find the answer to?